The mystery of the origin of matter seems to have been solved. At the middle of last week, CERN, the European Organization for Nuclear Research in Geneva, announced the discovery of a new particle that could be the long sought-after Higgs boson. The particle has a mass of about 126 gigaelectron volts (GeV), roughly that of 126 protons. "Almost half a century has passed since the existence of the Higgs boson was first postulated and now it seems that we at last have the evidence we have been looking for. What we have found perfectly fits the predicted parameters of the Higgs boson," says Professor Dr. Volker Büscher of Johannes Gutenberg University Mainz (JGU). The Higgs boson is important to our current fundamental theory of physics as it explains why the elementary building blocks of matter have a mass at all. Initial indications that the experiments at the Large Hadron Collider (LHC) were going to lead to a breakthrough were documented in December 2011. "We have since corroborated the recorded signal, and the new data demonstrate with a high level of significance the presence of a Higgs-like particle in the region we expected," explains Büscher. The new evidence comes from an enormously large volume of data that has been more than doubled since December 2011. According to CERN, the LHC collected more data in the months between April and June 2012 than in the whole of 2011. In addition, the efficiency has been improved to such an extent that it is now much easier to filter out Higgs-like events from the several hundred million particle collisions that occur every second. The data analyzed by the ATLAS detector, to which the Experimental Particle and Astroparticle Physics (ETAP) working group in Mainz made a significant contribution, found an excess of Higgs-like particles in all of the final states studied. "The rapid and yet careful analysis of the new data required a strong commitment over the recent weeks and months, and so we are especially proud to be able to announce such an exciting finding," says Dr. Christian Schmitt of the ETAP working group. At the same time, the second large particle detector of the LHC, the Compact Muon Solenoid (CMS), recorded events consistent with those of ATLAS and which matched precisely the footprint of the postulated Higgs boson. "We have been working towards this moment for years and are amazed that the LHC and its experiments have produced such results in only two and a half years after the first proton-proton collision," states Professor Dr. Stefan Tapprogge of the ETAP working group. The existence of the Higgs boson was predicted in 1964 and it is named after the British physicist Peter Higgs. It is the last piece of the puzzle that has been missing from the Standard Model of physics and its function is to give other elementary particles their mass. According to the theory, the so-called Higgs field extends throughout the entire universe. The mass of individual elementary particles is determined by the extent to which they interact with the Higgs bosons. "The discovery of the Higgs boson represents a milestone in the exploration of the fundamental interactions of elementary particles," states Professor Dr. Matthias Neubert, Professor for Theoretical Elementary Particle Physics and spokesman for the Cluster of Excellence PRISMA at JGU. On the one hand, the Higgs particle is the last component missing from the Standard Model of particle physics. On the other hand, physicists are struggling to understand the detected mass of the Higgs boson. "Using our theory as it currently stands, the mass of the Higgs boson can only be explained as the result of a random fine-tuning of the physical constants of the universe at a level of accuracy of one in one quadrillion," explains Neubert. Thus, physicists hope that the "new physics" will provide a more straightforward explanation for the characteristics of the Higgs boson than that derived from the current Standard Model. This new physics is sorely needed to find solutions to a series of yet unresolved problems, as presently only the visible universe is explained, which constitutes just four percent of total matter. "The Standard Model has no explanation for the so-called dark matter, so it does not describe the entire universe – there is a lot that remains to be understood," Büscher summarizes. The work of the Mainz physicists is integrated in the Cluster of Excellence "Precision Physics, Fundamental Interactions and Structure of Matter" (PRISMA), which achieved an impressive success in this year’s Excellence Initiative by the German federal and state governments. 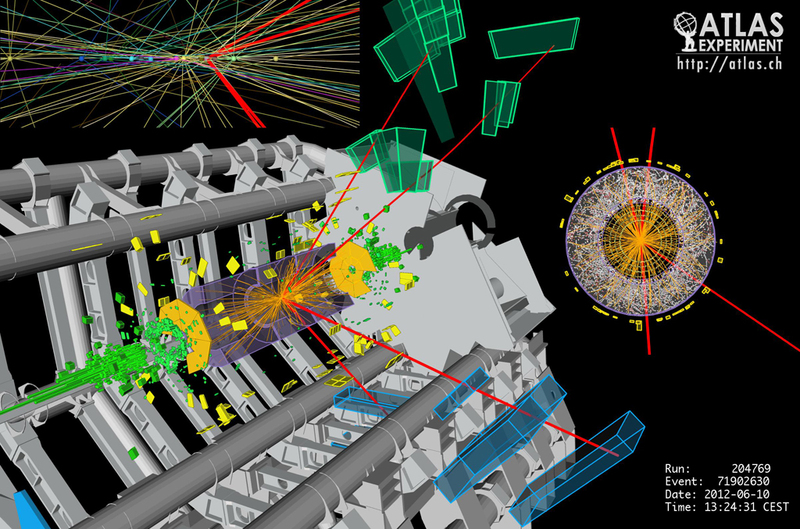 The image shows a collision recorded by the ATLAS detector on 10 June, 2012 during which a Higgs particle was produced with a high level of probability. This boson immediately decayed to form other elementary particles (muons, represented by red lines).